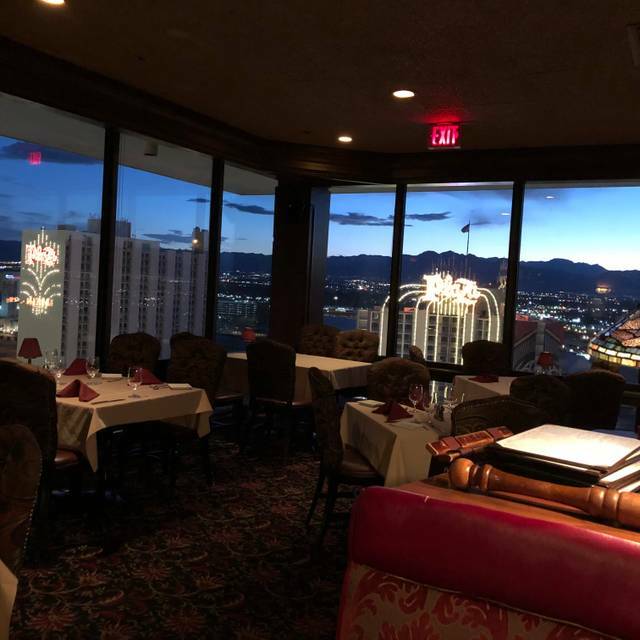 You must make reservations at least 5 minutes in advance of the time at Top of Binion's Steakhouse. We Offer 24 hour parking with Steakhouse validation in our parking garage located off of Casino Center Drive. The Ace and Deuce Strip buses drop off on Casino Center Drive adjacent to the Four Queens and pick up is on Casino Center Drive adjacent to Binion's Gambling Hall. 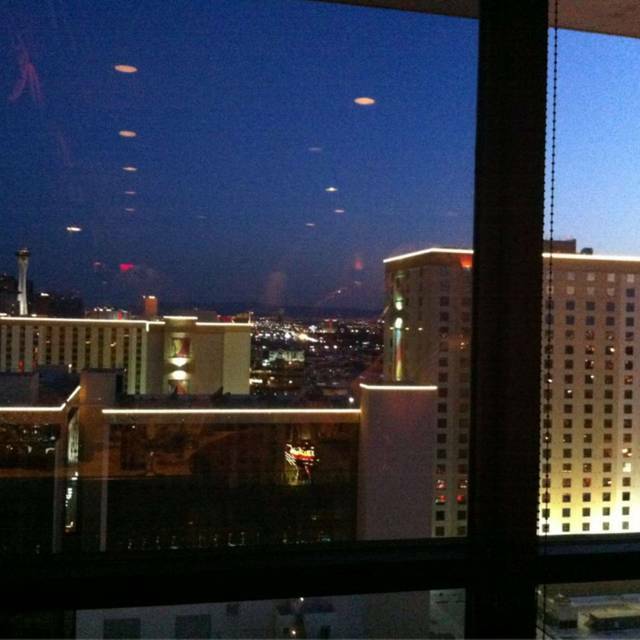 THE place for superb food and spectacular views of the Las Vegas skyline. 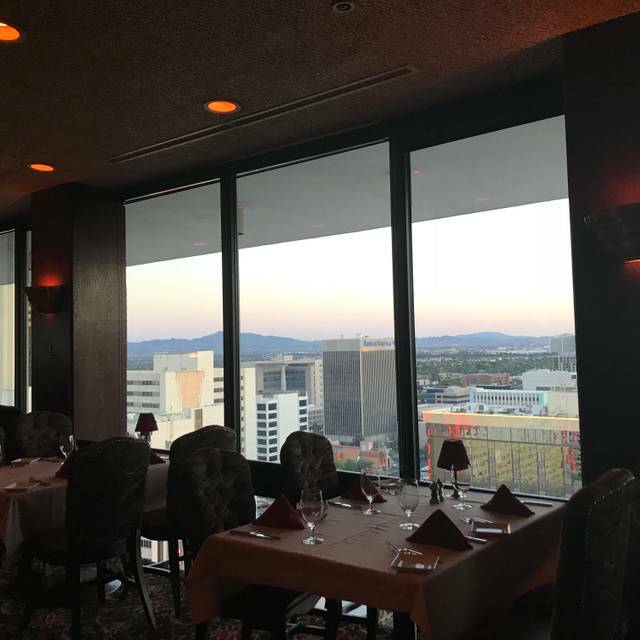 Set on the 24th floor of Binion’s tower, it is a perfect choice for a romantic dinner or special occasion. For steak lovers, we take great pride in featuring Creekstone Farms Midwestern, corn fed, premium black Angus which has been aged for at least 28 days. Or indulge your appetite for chicken, seafood, veal or lamb, or our signature dish Chicken Fried Lobster, all of which include a side dish and vegetable. Also, don’t forget to check out our chef’s daily specials, priced at $19.95. Be sure to make your reservation to Vegas’ best kept secret. I enjoyed my Filet. My friends got a rib eye and it had too much fat in it. Needed a saw to cut it. we have been here many times over many years. It has remained a place of consistently high level of service, food choice/quality, and ambiance not matched around town. Sure, there are many steak houses----but there is only one Top Of Bionions. Great Service !!! Waiter has been there for 30 + years. Shook hands with everyone at the table. Great Food as well !! This has more of an old Vegas feel to it. The elevator that takes you to the top floor where the restaurant is located seemed a little shaky but the view is spectacular. Food was excellent and so was the service. I had the filet and it was delicious. I would go here again. I really live to come to this steakhouse for the view. 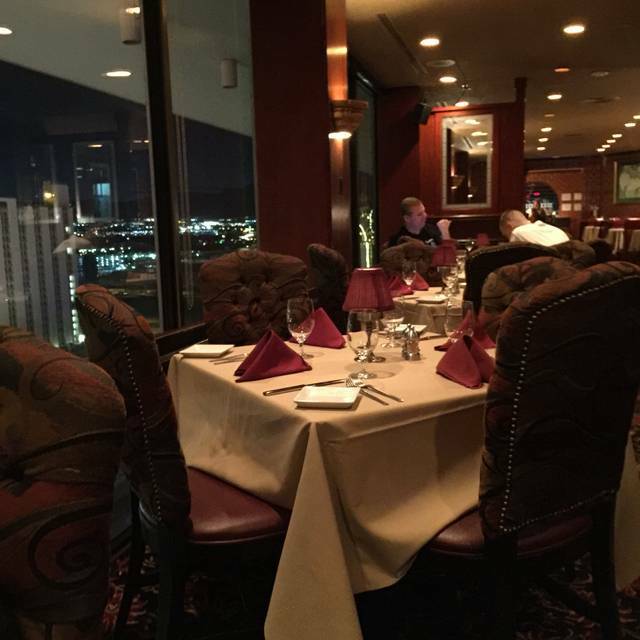 The restaurant is set in downtown Vegas and seems to carry a historic with "old gangster " vibe. Steaks are pretty good and the service is top notch! When I’m Vegas we dine at Binion’s at least once. Service is outstanding, from the hostess to the waiters and staff. Great cocktails and wine selection as well. My garlic potatoes were not piping hot but the filet mignon was excellent. I definitely would recommend Binion's Steakhouse. The food and service was very good. And the view was great. The food was excellent. In particular, the warm spinach salad was outstanding, the best I have ever had. The filet mignon was tender, flavorful and fabulous. The service was impeccable, particularly our server German. He made an outstanding meal beyond outstanding with the level of attention and service that he provided. 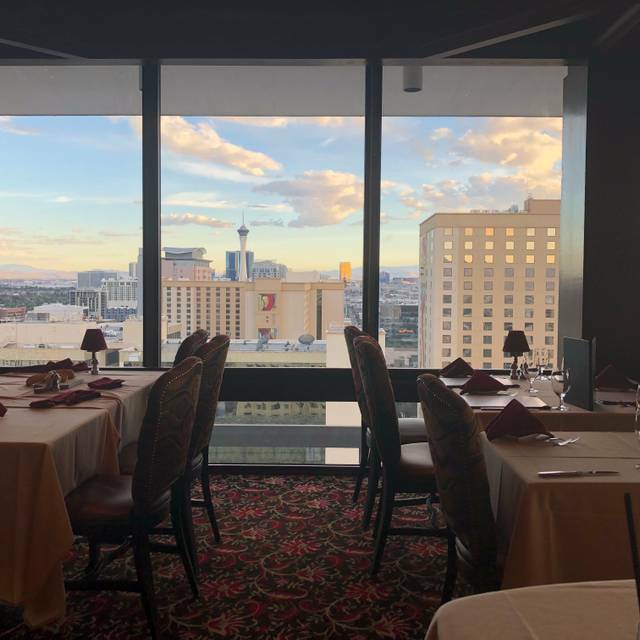 We like to travel to Vegas annually, we will make a point to visit Top of Binion's Steakhouse when we are in town, and we will definitely ask for German to be our server. Those of you that only dine on the strip need to venture downtown and get a taste of "old school" Vegas. You will be glad that you did. We wanted to go have dinner on Fremont Street and Binions game highly recommended. I’m a very picky steak eater having grown up on a ranch but this place didn’t disappoint. The steaks were very well cooked although I will say ours probably was just a touch overdone. We got the blue cheese encrusted version and it was delicious. Everyone else got filets and they were perfectly cooked. The bottles of wine were shockingly reasonable for price and they still had a great selection. Overall a nice dinner with some very good steak for a reasonable Vegas price. Service and food were OK, evening going good till I paid, on invoice is different percentages to pay I chose 20 percent I paid with cash the amount I gave with 20 percent tip I should have received 11.00 dollars change, waiter is sharp he does not ask if you want change back he asks if you want an invoice of course not so he kept the change, i called him on it he said oh I will give it back I let him keep it if 10.00 is a big deal to him and the restaurant I figure I am helping this guy. I would not go back because of that. Binions is a great old school steak house with great service. Everyone is very friendly happy to just do exactly what you want. Great view had a great filet is a bout noisy but anything that would spoil your occasion. We enjoyed good food, especially the baked potato. It was the best restaurant potato we have had in years. Our order came as a unit, not separate units that add up on the bill. The service was perfect, not too much or too little. We will certainly return when back in Vegas. A wonderful dining experience in the old town. Delicious rib eye and huge baked potato all in a very warm pleasant environment. The service was first class. The best meal of our trip. We had a wonderful dinner and thoroughly enjoyed ourselves. Mario, our waiter, was outstanding. The hostess was great. We will definitely be back when we are in Vegas! We celebrated 2 birthdays this time & were nor disappointed. The "small" 16 oz prime rib was probably 48 oz of luscious beef. Had a great dinner, service was awesome. They were very accommodating of our change in schedule and the food was very good. Sat down at our booth and the A/C was blowing directly on us. Stupid cold so we asked to move to another table which they did. Ordered our food and wine then the A/C on that part of the restaurant cranked up blowing directly on us again. In other words we had $300 worth of ice cold filets and cold lobster. We expected soooo much better dining experience. Would never recommend this place again. I return to the Top of Binion's every year. Great view of Las Vegas along with excellent food and service. The spinach salad with hot bacon dressing is not to be missed along with the lobster! We really enjoyed being treated special and being recognized with a special card and dessert from the staff. Mario treated us very well! This is our 2nd Time there in about 6 months. Service is horrible the bussers help you more than the wait staff. But they can only do so much before they say “let me get your server”. Food was okay but we had to send my girls food back twice because no one pays attention to how you ask for something to be prepared in your order. Gave it a second chance and was not pleased. Sorry won’t be going back again. The steak was delicious, actually, the dinner was delicious. Portions were very large and the service was excellent. The food was great but the service was better. Our waiter was really funny. Great service by Mario. 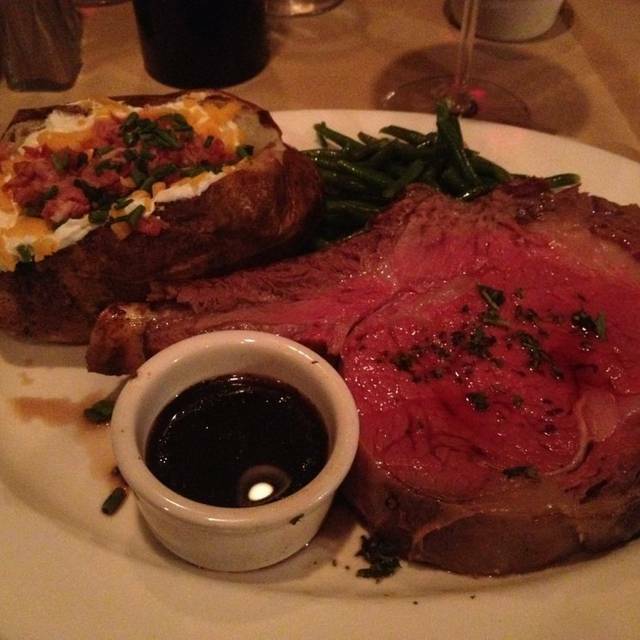 We had the ribeye and prime rib- wonderful! It comes with vegetable which tonight was green beans and baked potato or upgrade for at gratin cheese potato. We were so full that we didn’t even look at the dessert menu. Great view of downtown and all of Las Vegas. Always a stop when we travel to Las Vegas. 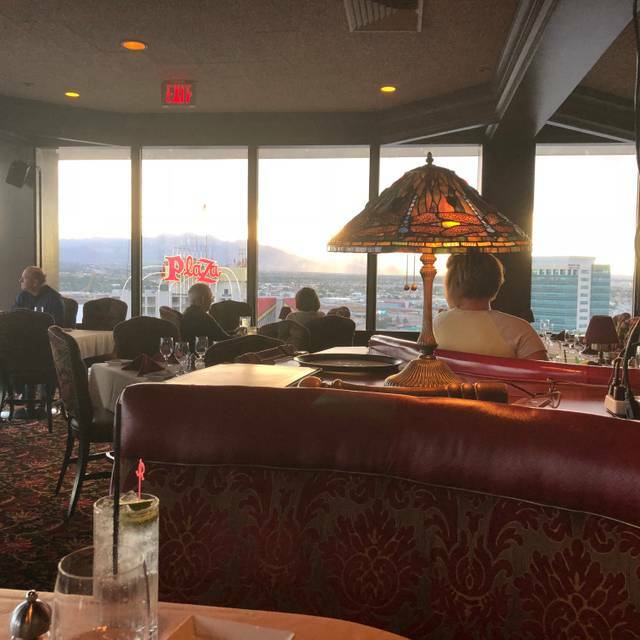 Situated at the top of Binions Casino, Top of Binion's Steakhouse has a great view of Fremont street and surround Las Vegas. I addition to traditional steakhouse food, there were a number of seafood options as well. We had filet and salmon which were both excellent. Service was excellent as well. Been to this restaurant several times. The food is great, the service reliably strong. It has an "old Vegas" feel to it. If you're bringing someone that's never been, just blindfold them through the experience downstairs. The Binion's property is a dump, although they're in the process of updating it. Once the elevator opens to the restaurant, it's all good. Great service, great food! Will eat there again next year. Our server was amazing, it has been a couple of days so I forgot his name. We were there on Wednesday night. He was honest and professional. We really liked him. The only downside was the 6 top behind us that was yelling profanities while raucously talking about inappropriate things. We were celebrating our engagement and trying to have an intimate dinner. Obviously that was not the restaurants fault. The food was amazing (who knew that chicken fried lobster was even a thing) but it was so good. I had the filet served Oscar style and my fiance had the Porterhouse oscar style. My baked potato was immense and so delicious! Great place and would have been a perfect 10 if not for the loud group behind us. Great view of the city, as well as great service by the staff. Side portions were much larger than anticipated and the food was very good. Would highly recommend! Excellent view, food, service and atmosphere. Jeffrey was outstanding and made us feel like we were his only customer. Worth every penny! Outstanding, as usual! 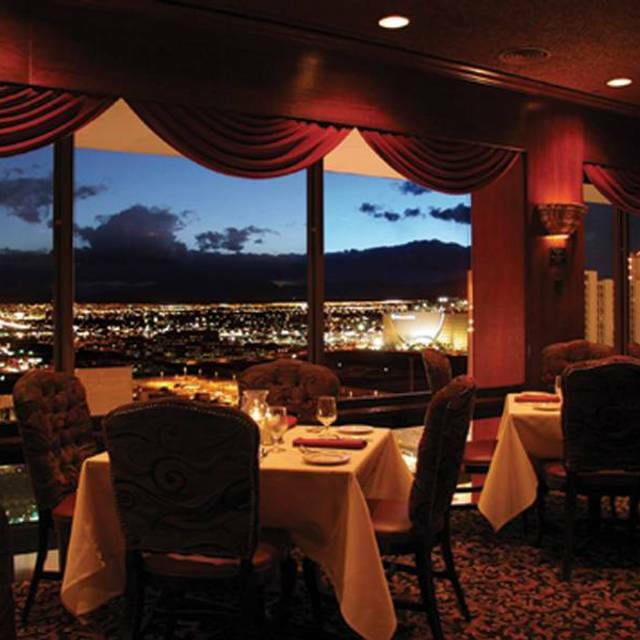 We have made Top of Binions Steakhouse a priority meal the past several times we visited Las Vegas. The view, the service and the food are incredible. I can’t wait to go back! Excellent steak, dinner includes sides which are delicious. I opted to spend a little extra for the au gratin potatoes- totally worth it! Lawrence is an experienced and amazing server! Great value and maybe 60% of the cost of the Strip. Best views in the City. Service was 5 star level, as was the food. Very old school, delicious steaks and wonderful service. Great view of Fremont Street. 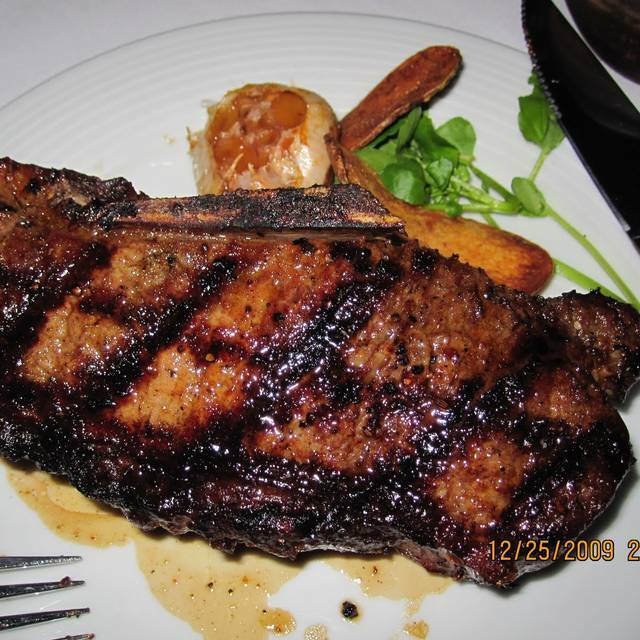 Definitely I would go again for good food without all the fuss and expense of some of the steakhouses on the strip.